Saints Of The Underground, formed by members of mega-groups Ratt, Warrant, and Alice Cooper, created their debut CD entitled, "Love the Sin, Hate the Sinner." Formed by Bobby Blotzer (Ratt's drummer) and Keri Kelli (guitarist for Alice Cooper), Saints Of The Underground quickly recruited Jani Lane (Warrant vocalist) and Robbie Crane (Ratt's bassist) to fill out their roster. Separately these accomplished musicians have achieved multi-platinum successes, but together they have pooled their talents into an exciting new sound that fuses killer hooks, big guitars, and rock-n-roll attitude. "With more than six decades of combined experience, S.O.T.U. represents classic hard rock with current elements of today's rock genre," said Keri Kelli. The formation of Saints Of The Underground happened quite unexpectedly, as the four musicians started out playing cover tunes together for fun during off times from their respective super groups. They so enjoyed their chemistry that the band naturally evolved into a creative partnership through which original songs began to emerge. "For me, S.O.T.U. was like when a Monty Python skit stops abruptly and you hear a voice over say, 'and now for something completely different'," commented Jani Lane. "I was in a very slow and boring rut when I got a call from the guys. It really got the creative juices flowing again...and some other juices too!" S.O.T.U. decided to capture an array of material entering Bobby Blotzer's Diamond Recording Studios in Texas to track drums and bass, while also overdubbing guitars and vocals at Keri Kelli's studio in California. "We were psyched to start recording together," commented Blotzer, "and we each brought something special to the songs." 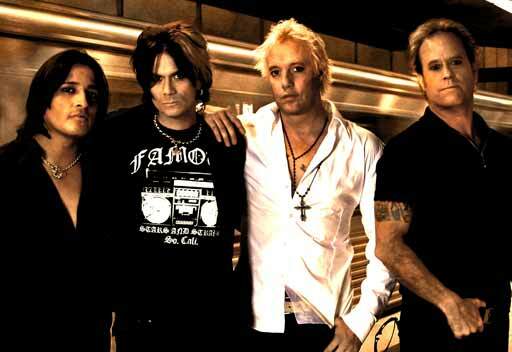 The result is their debut CD, "Love The Sin, Hate The Sinner," written and produced by Bobby, Keri, and Jani Lane. "We had the opportunity to mix our record with Andy Johns of [The Rolling] Stones and [Led] Zeppelin fame," said Lane. "He was an English prince and we had a blast working together." Their debut CD has generated buzz from the industry featuring enough heavy grooves, hooks, and memorable melodies to satisfy even the most demanding rock-n-roll aficionados. Tracks like "Dead Man Shoes," "All In How You Wear It," "Signs Of Life," and a mesmerizing version of the Rolling Stones classic, "Moolight Mile," have this debut rocking along to a familiar yet distinctive beat that is sure to please fans, both old and new.